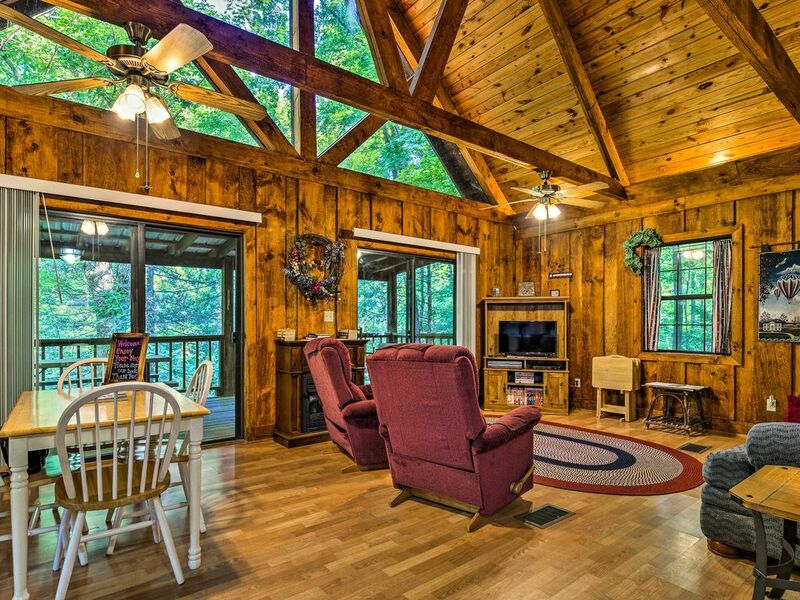 Your East Tennessee adventure begins at this 1-bedroom + loft, 1-bath vacation rental cabin. 'Freedom Cabin' offers 1,200 square feet of living space and sleeps up to 6 guests with ease. This remote setting allows you to truly escape from it all while still enjoying the comforts and amenities of home. The property boarders the Cherokee National Forest and is situated on a beautiful creek, sure to excite outdoor enthusiasts and nature lovers. It's an easy day trip to Pigeon Forge and Gatlinburg! You'll feel immediately at ease when you arrive at this secluded cabin, surrounded by lush greenery. You'll hear the creek that runs through the yard as you unload your car and settle in! The interior is furnished with comfort in mind, featuring rustic decor, wood paneling, high ceilings, and ample seating for your group to gather and spend time together. Sit back and relax in the living area as a movie plays on the flat-screen cable TV or use the free wireless internet to research your next hiking trail. When you've worked up an appetite, step into the fully equipped kitchen to whip up a home-cooked feast. Choose between the eat-in kitchen table or a picnic table right out on the deck! Rest up for the next adventure-filled day with 3 queen-sized beds. The cabin offers 1 bedroom, while 2 additional beds can be found in the cozy loft. Located in the East Tennessee Mountains at the edge of the Cherokee National Forest, the cabin offers the perfect launching point for all outdoor adventures. Tellico Plains is the gateway to the Cherohala Skyway, the Tellico River, and the Bald River Falls. Anglers in your group will be thrilled with access to some of the best trout fishing in the country! Just 12 miles from the historic town of Tellico Plains, you'll find shopping, dining options, and a fantastic bakery in town. If you'd like to venture out for a day trip, Pigeon Forge, Gatlinburg, and Dollywood are within a 1.5 hour drive. This is a great cabin. We loved everything about it. The stream in the back was the best. Loved it! Disappointed when the direction didn't say it was another 36 miles past where GPS takes you. Once there it was a nice setting, a little dated on lighting and decor. If you don't mind getting woke up at night by a bang ting ting ting.......bang ting ting ting (acorns hitting the tin roof on the porch) I thought I was under fire by mad squirrels. Lol my husband and I had a good laugh once we figured out the squirrels weren't firing on us just trees dropping their nuts.